Topas Ecolodge Review | Sapa Accommodation with Sensational Views! 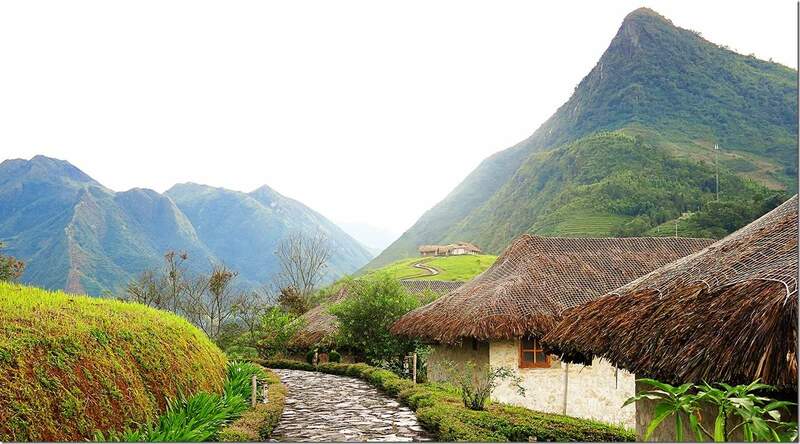 The setting and views from Topas Ecolodge will impress even the hardest of hearts! This Sapa luxury hotel instantly made us think about ‘Maldives’ or ‘Bora Bora’ but set in between mountains and rice paddies instead of water. The rooms are designed in an ‘eco’ focused manner, so whilst they are luxurious they are also oozing elegant simplicity, which fits in brilliantly with the natural feel of Sapa in Vietnam. 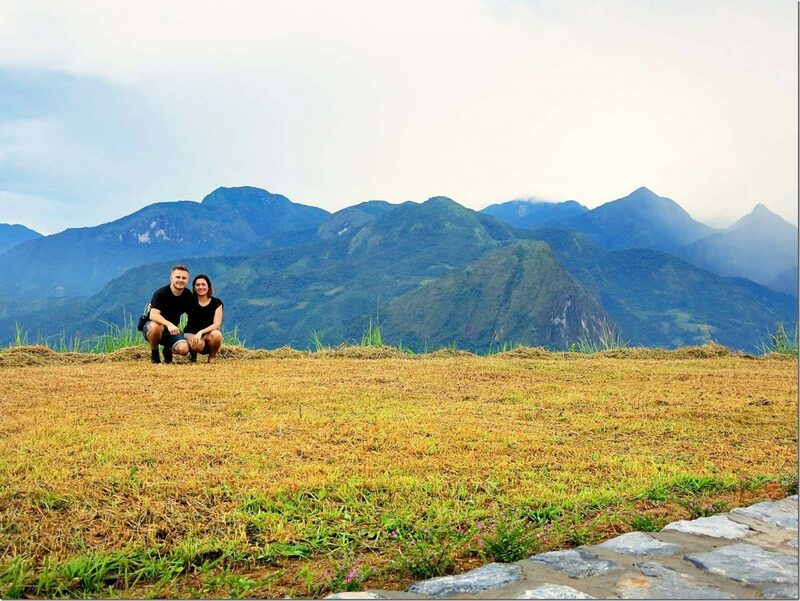 Let us show you why this Sapa Ecolodge will stun and amaze you! 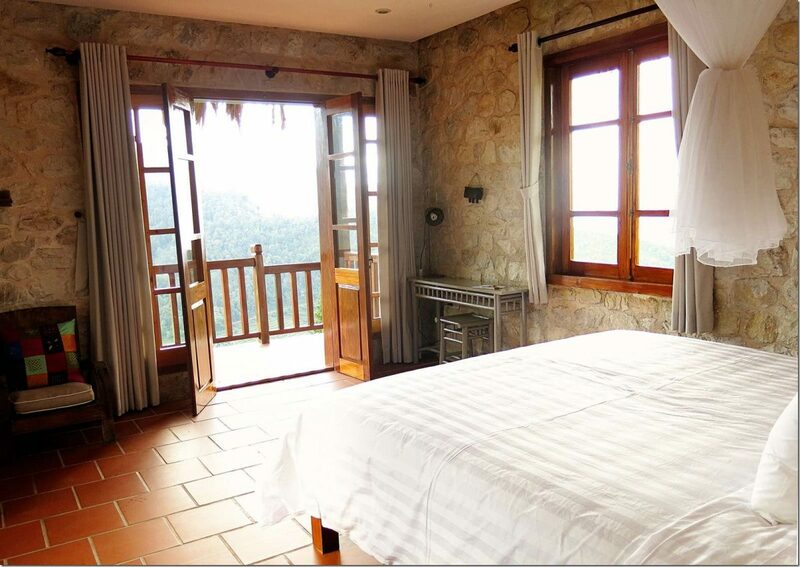 Click here to see the latest prices to stay at Topas Ecolodge Sapa. 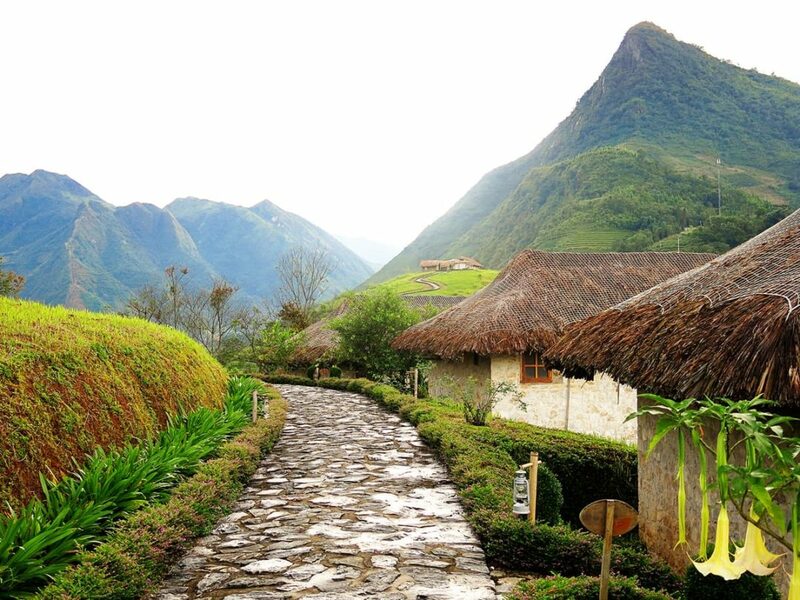 Where is this Eco Lodge Resort? View of the surrounding mountain range of Topas Ecolodge Hotel Sapa! 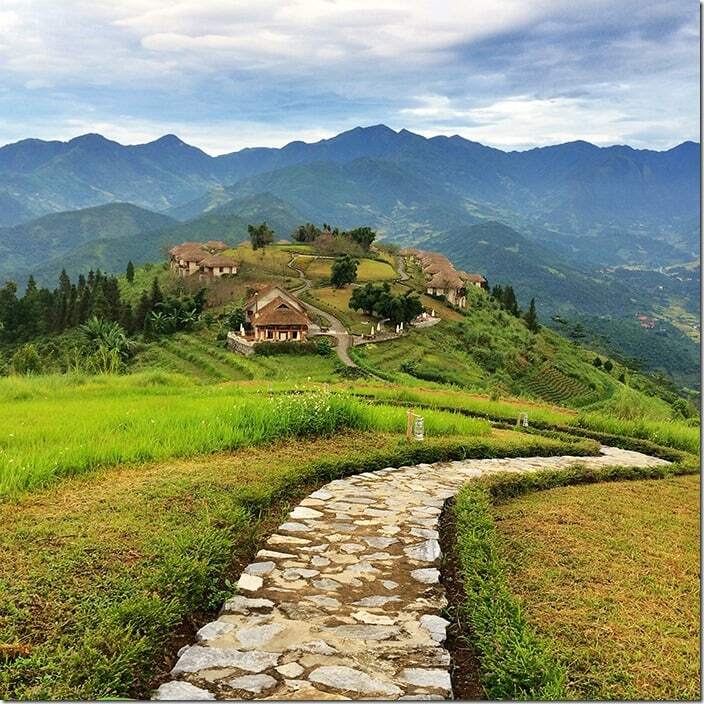 Topas Sapa Eco Lodge is located only 45 min (18km) outside Sapa town in the North Vietnam. 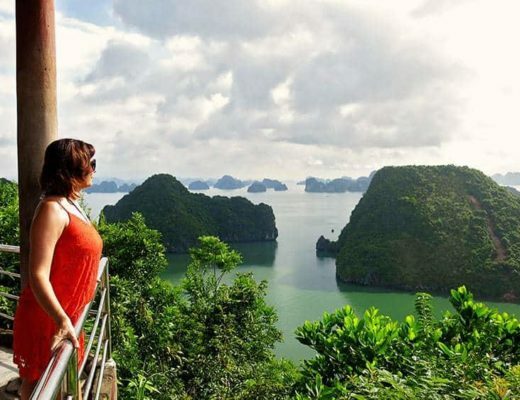 It happens to be one of the top Vietnam Eco Resorts and it is easy to understand why! The lodge is perfectly situated on a beautiful hilltop, deep in the mountains of Hoang Lien National Park. Making it an ideal location to do some hiking in Sapa. Wondering how to get to Sapa? 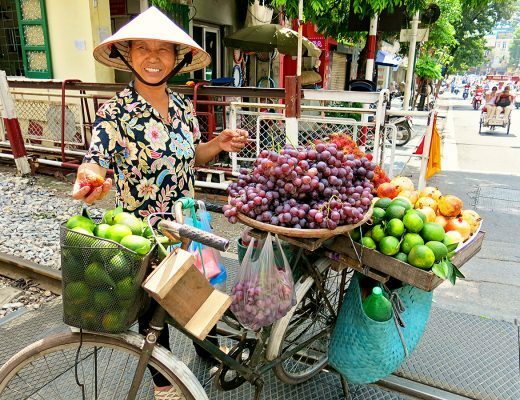 How to get from Hanoi to Sapa (and Vice Versa)! 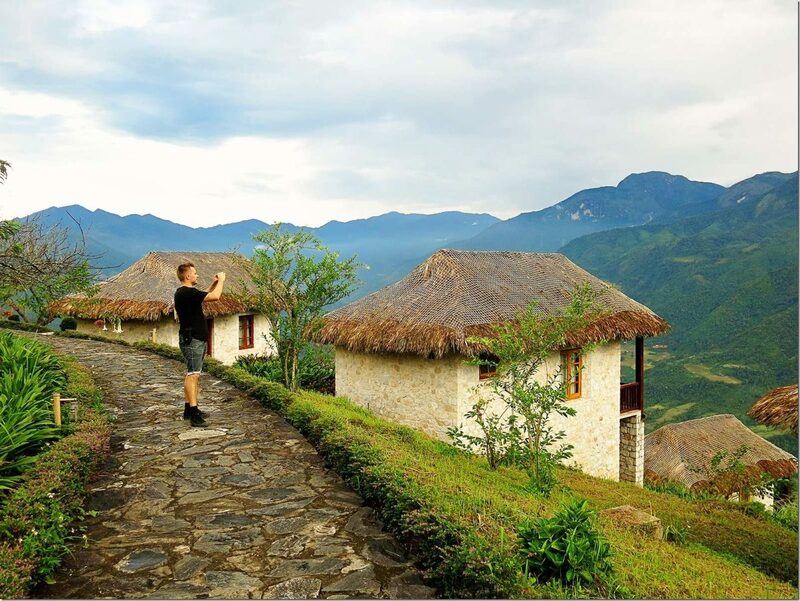 The Sapa Topas Ecolodge consists of 25 mountain bungalows all built as rustic chalet-style houses from local white granite. 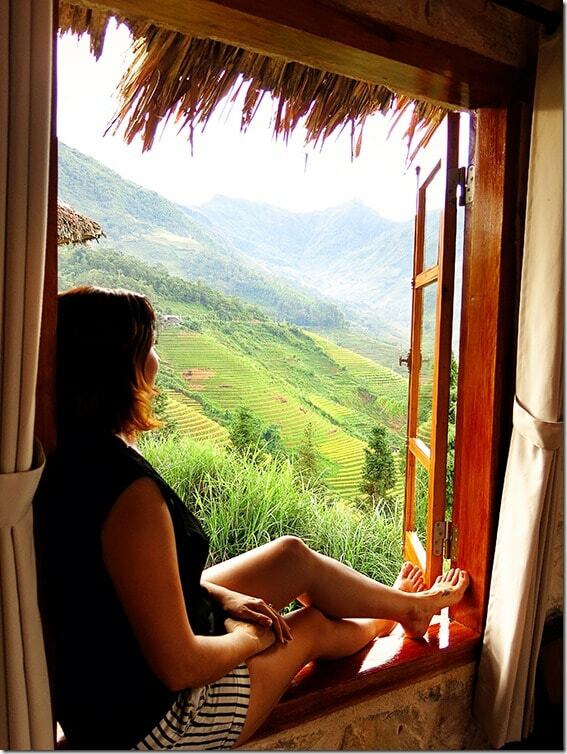 All have their own private outlook on the incredible Sapa valley surrounding the hotel. Upon arrival at this Sapa hotel, you will be asked to wait at the ‘outer reception area’. There they will collect your bags from you, give you your keys and explain to you how to get to your own bungalow. You will need to walk from there to your bungalow. Whilst it is a bit of a walk, the views are just incredible and it truly does make for a delightful stroll! They will bring your suitcases down to your house, so you don’t need to worry about dragging your luggage behind you. The Topas Lodge is truly unique as it is based on sustainable principles. The owners want to ensure that the lodge has a minimum impact on the surrounding beautiful environment. Together with them being eco-friendly, they also take pride in employing local people. Therefore you might have to switch on your patience levels as some of the staff might not be 100% fluent in English yet. Whilst the lodge might be situated 45 min drive from Sapa town itself, the lodge does offer a free shuttle bus that operates on three different time slots in the day. It is important to note that the last shuttle bus leaves Topas Ecolodge at 13:50 and returns at 16:10. There are two sets of bungalows at Topas Ecolodge. We chose to stay in the cheaper of the two options and snapped up a Deluxe Bungalow for a night. These bungalows are built to overlook Ban Ho village to the south and have the Hoang Lien mountain range as a beautiful background. The Executive Bungalows, at a slightly more expensive price per night, overlooks Thanh Kim village to the north together with more unique mountain ranges as a backdrop! The Bungalows themselves are truly beautiful. They are rustic, but the ‘rocky’ feel of the building suits the environment perfectly. They are simplistic, but elegant and luxurious none the less. Inside you will not find any TV’s, you will not find WiFi access, but what you will find is views that will truly stop you dead in your tracks!! Click here to see the latest prices to stay at the Topas Ecolodge Vietnam. Our weather was a bit temperamental … as it is throughout all of Sapa. We arrived in some rainy weather and the views were covered up by low lying clouds. But once they cleared … we knew that we had made the right choice to splurge out on this luxurious accommodation in Sapa for a night! Inside the cottage, you will find a gorgeous, cosy bed. There is also a mosquito net available, and you can purchase some bug spray from the reception area if you need. We didn’t really have a major issue with bugs or mosquitoes. In the corner of your cottage, you will also find a splash of colour in your chair decor, together with a set of some candles to help create the romance if necessary. Beautiful views from all different angles! It was hard to leave the beauty of these gorgeous rice fields behind the next morning!! The best Vietnam Eco Resort! In the main building on the grounds, you will find the Topas restaurant. As breakfast is included in your price of accommodation, this is where you will go to fill your bellies in the morning. You can also purchase your other meals from this restaurant. We splurged out for dinner there on our night, prices for food are a lot more than what you would be used to in Vietnam. I guess that comes with staying at a more expensive hotel altogether. Recommended Reading on What to Do in Sapa! Together with the restaurant, they also have a lodge lounge. Here you can enjoy relaxing whilst also catching up on life and goss on the web. 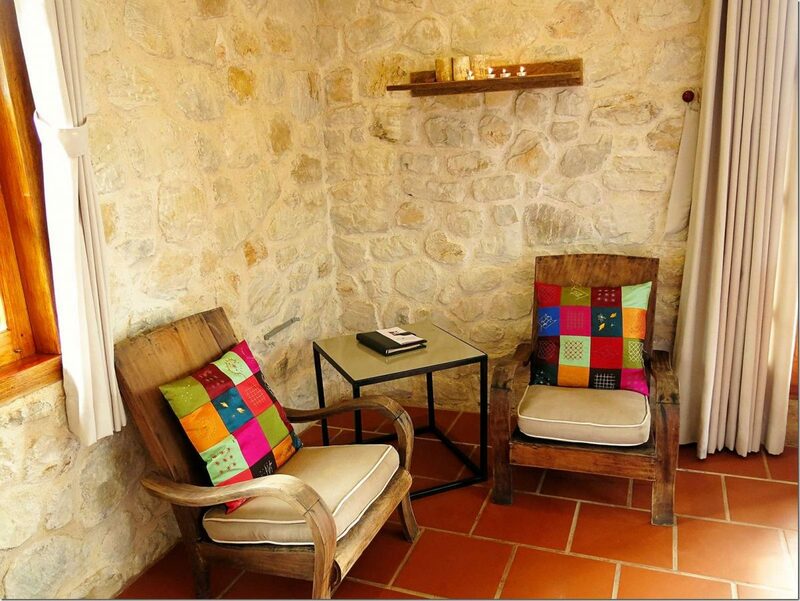 It is one of the few spots at Topas Ecolodge that has Wifi access. But then mind you, I’m not sure how you could possibly stare at a phone or computer when you have these views surrounding you there? After Sapa Hotels with Views? Well, look no further!! When the weather cleared up, we also enjoyed a bit of a stroll up to their viewing platform. Again incredible views, but also just a good place to come and relax and breathe. 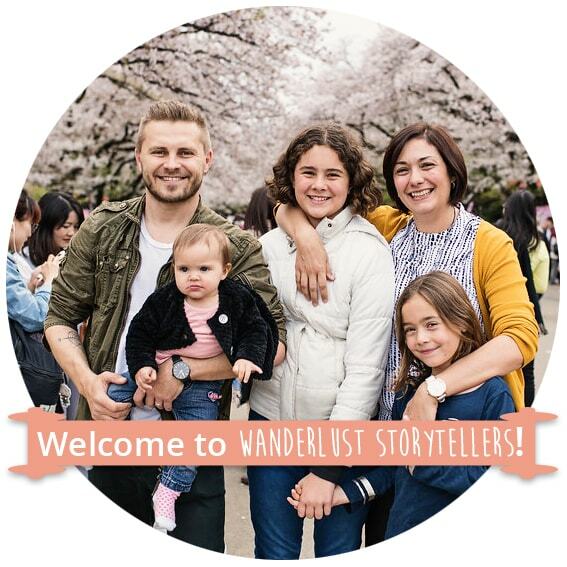 Be present and absorb how lucky you are to be in such an incredible spot! … you love simplistic luxury with an eco-friendly approach. … you are after a more luxurious Sapa accommodation option. 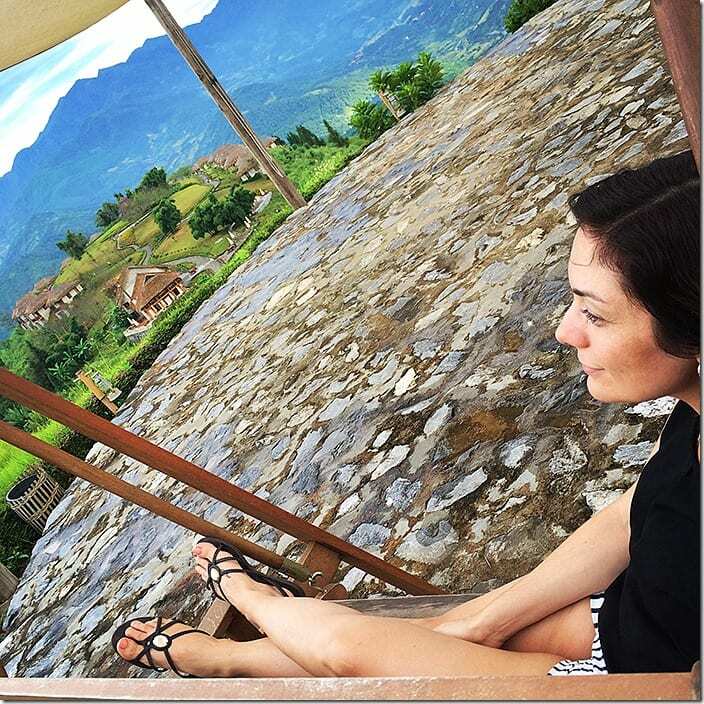 … you love the mountains and amazing views. … you love feeling secluded from the world. … you like peace and quiet. 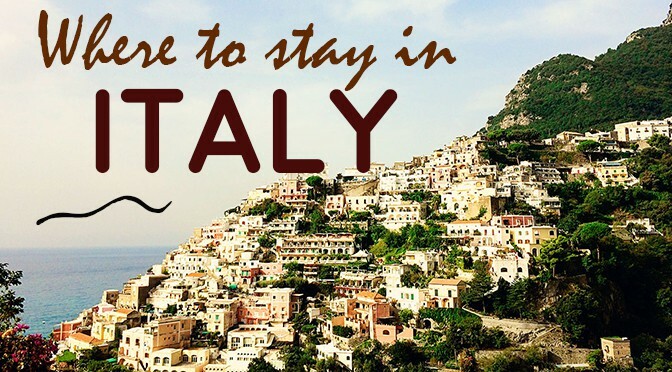 … you don’t mind tackling some challenges that come with being set so far away from the town. 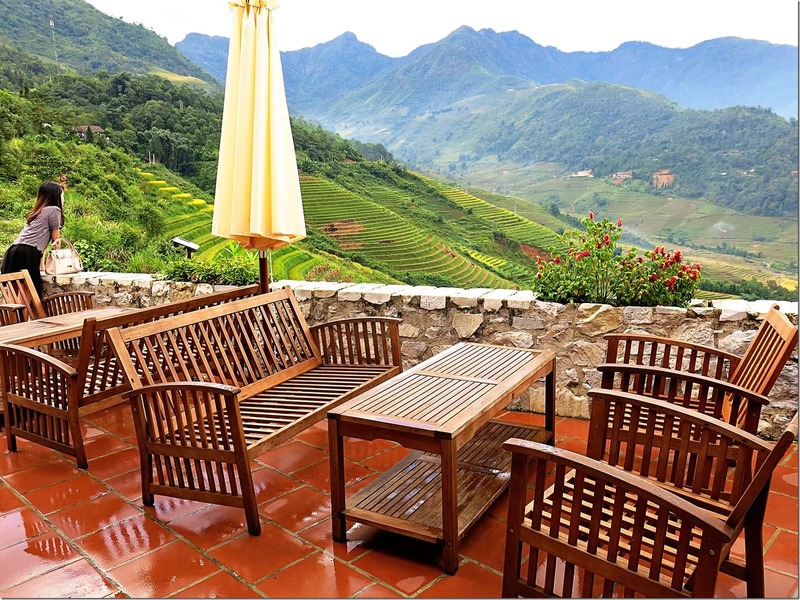 Where: Topas Lodge Sapa is situated on a beautiful hilltop deep in the mountains of Hoang Lien National Park, only 45 min outside Sapa town in North Vietnam. Still feeling unsure? Why not have a look at the Topas Ecolodge reviews on TripAdvisor to see what other guests thought! * Please note we stayed at this hotel at our own expense. We wanted to splurge and treat ourselves to some luxury as it was our 1 year wedding anniversary. 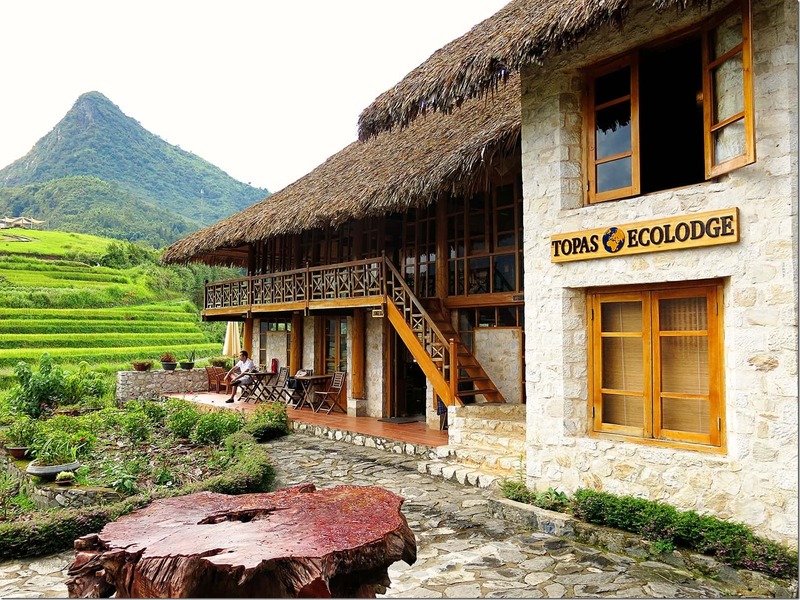 This post is our honest reflections as a Topas Ecolodge Sapa reviews post. I dont know if you remember but which deluxe bungalow did you stay in? I want a view like yours! I heard some deluxe has better views than others. Oh wow that photo where you sit in the window..what an amazing you did you have! The view from the place I stayed at in 2015 had a great view, but not as wonderful as yours! Haha. Gosh this place is beautiful! Would love to stay here. Yes! It is one-of-a-kind! We only stayed there for one night but I couldn’t resist when I found it on the web!! What a beautiful place ! I love your photos ! Thank you!! And yes it truly is a one-of-a-kind sorta place! Oh wow, what a view. So beautiful! I would love to go there, to hike and to paint! Just awesome. Yes, it would be a wonderful place to base yourself and get lost in your art! !